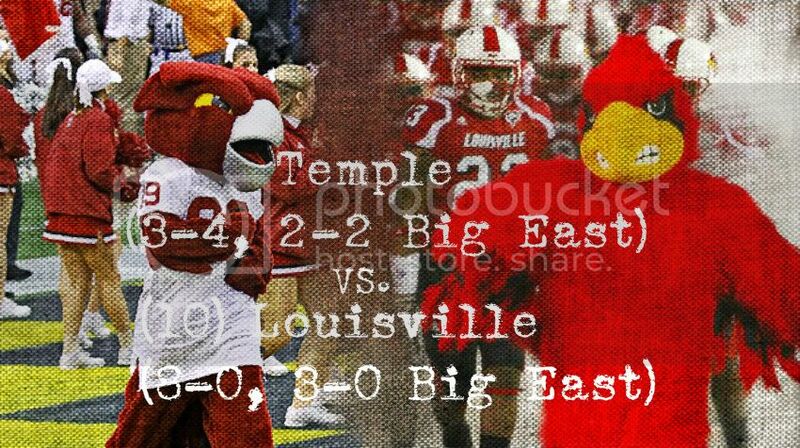 The Temple Owls come to town this weekend and it could be a real “HOOT” for our Louisville Cardinals. They have a shot to go to 4-0 in the Big East and 9-0 on the season for the first time in school history. In 94 seasons of football our Cards have never reached this mark. Our Cards are currently ranked 10th in the ESPN/USA Today Coaches and 12th in the Associated Press Poll. And they took a huge leap to rank 10th in the BCS standings. Temple enters their second consecutive big east road game after getting manhandled at Pittsburgh this past weekend 47-17. The Owls big running back Montel Harris did gain 72 yards and a TD for the Owls, but he was the only guy with any significant production on the day. The Owls usually mobile Quarter back was eaten up by the Pitt lineman as he only had 22 yards in rushing. He also had a nonproductive day passing the ball as he only threw for 143 yards and one TD. They did have huge success in one area that should be a concern to Louisville fans. Running back Matt Brown tallied 120 yards on 3 kickoff returns. Our Cards had issues last weekend stopping UC on punt and kickoff returns. They will need to improve their susceptibility to the big return this weekend. Our Cards come into the game on Saturday after a thrilling overtime victory against UC. The Cardinals and Bearcats exchanged big play for big play and multiple TD’s in one of the most exciting “Battle of the Keg” games I’ve ever seen. Teddy QB continued his remarkable sophomore campaign throwing for 416 yards and two touchdowns both in impressive fashion in the 4th quarter to Devante Parker. The 64 yard touchdown was followed up by an amazing 64 yards catch where Parker bobbled the pass and tight-roped the back of the end zone as he regained possession for the score. Parker finished with 4 catches for 120 yards. The Owls have been competitive in most all of their Big East games something that has come as a surprise to many who thought it would take a year or two to adjust. Temple was a Big East member in football only from 1991 to 2004 but was forced out because the program was one of the worst in major college football. The Owls failed to meet minimum requirements for membership, most notably in attendance, facilities and fielding a competitive team. Eight years later, Temple is a competitive program, and the Big East, in need of football-playing members after the departure of several schools, invited the Owls back into the fold. Only nine starters are back from last year’s nine-win team. But Temple’s most important returnee could be head coach Steve Addazio who is affectionately referred to as “Vitamin A” because of his high-energy nature on the practice field, on game days and on the recruiting trail. Addazio replaced Al Golden at Temple in December 2010. He was the former Florida offensive coordinator and at one time was on the same coaching staff with Coach Strong. Temple is taking a step up in weight class from the MAC to the Big East, and they are trying to prove that they won’t be the league’s punching bag. To have a shot against our Cards the Temple D will need to wake up quickly. After yielding 530 yards to an average Pitt offense, the Owls will now face a much more productive squad in our Cards who can both air it out and get yards on the ground in chunks. They will also need a big day from their stud running backs Montel Harris and Matt Brown. QB Chris Coyer will also need to do his part on the ground and through the air. It is important to note that our Cards have been soft against the run the past few weeks, and Temple is a run first offense. Who knows if this will have any effect on our game on Saturday but I did think it was important enough to mention in my pre-game write up. Even though this game has all the makings of a classic trap game. I really have no concerns as our Cards have faced much adversity this season and seem to always battle out of it. Our Cards boast one of the conference’s best players in Teddy QB. Running back Senorise Perry and wideouts DeVante Parker and Damian Copeland are also among the league’s elite players at their positions. And free safety Calvin Pryor and middle linebacker Preston Brown are regarded as two of the league’s best defensive players. After boasting an 8-0 start I have no doubt that these guys will get the job done. I fully expect Temple to come in and have a great game and that it will be a battle. They all have been battles. But Our Cards will get the win and make history by going to 9-0 on the season. 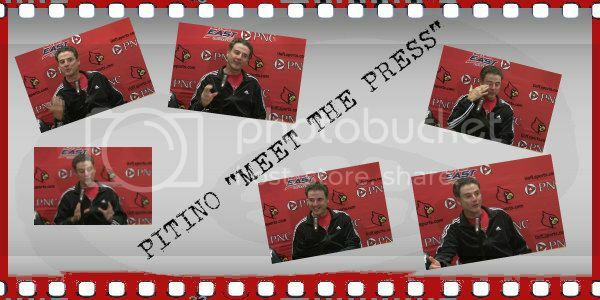 -Coach Pitino has first meeting with media before Thursday’s Exhibition opener. Pitino met with the media today in a very informative press conference. It was announced that Coach Pitino would be at UofL through the year 2022. Pitino was ask about many things including his team, his horses, the hurricane, and former player TWill. Some other things from the presser today. Coach talked briefly about TWill and said that he thought he had the body, passing, and dribbling ability for the NBA. And says that he just needs to find a team that he blends with. We also found out that they will present Elisha Justice with his Final Four ring before the Pikeville game. Cardinal nation got some very good news Monday when Edwardsville, Ill., standout guard Emmonie Henderson committed to the Louisville women’s basketball team. The 6-9 guard picked the Cards over the Tennessee Vols. And this could just be the beginning of perhaps several big commitments for Coach Walz as the No. 1 player in the nation Mercedes Russell will pick between U of L and Tennessee at some point in the next few days. Also the reigning Class 6-A Oregon state Player of the Year Jordan Reynolds who is one of the top guards in the country could make her decision very soon. Coach Walz and his 2012-2013 Women’s basketball team were on display Saturday afternoon as they scrimmaged briefly before the Men’s team took the floor. Here are some pictures and video from that scrimmage. The women’s team is currently ranked #9 in the country. 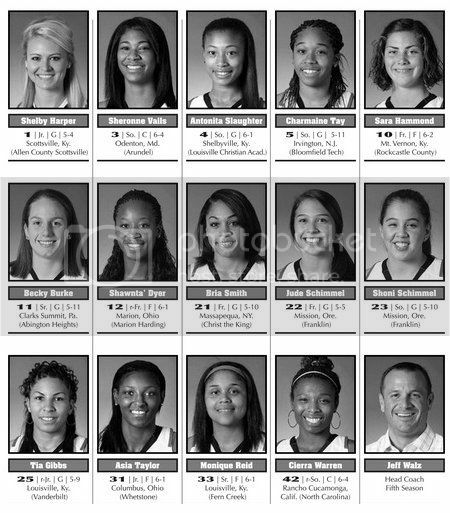 They will kick off their season on Wednesday the 31st when they face Eckerd College.